Dante's Pythagoras Citations in "Convivio"
Paget Toynbee's "Dante's References to Pythagoras" [Romania (1895) 376-384] shows that Dante mentions Pythagoras 8 times 7 times in his Convivio and once in the De Monarchia. Dante also mentions his followers, the Pythagoreans, once in the Convivio. Lansing's translation (1990) of Dante's Convivio lists Pythagoras & Pythagoreans 7 times in his index. The Princeton Dante Project has a "Minor Works of Dante (Opere Minore)" web site. 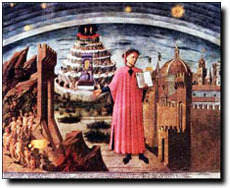 A word search for "Pittagora" in Dante's Convivio yielded 8 citations 7 "Pittagora" & 1 "Pittagorici". They are listed below together with Lansing's translation of Dante's Convivio and Dante's sources according to Toynbee. Dante's Monarchia in Latin is available at George Mason University. The translation is from Prue Shaw's Dante, Monarchia, Cambridge University Press (1995). per che Pittagora, secondo che dice Number exists not only in all of them together, but also, upon careful reflection, in each one individually; for this reason Pythagoras, as Aristotle says in the first book of the Physics, laid down even and odd as the principles of natural things, considering all things to have numerical aspect. Chè li Pittagorici dissero che 'l Sole philosophers have held different opinions. For the Pythagoreans said that the Sun at one time strayed from its path, and, passing through other regions unsuited to its burning heat, set aflame the place through which it passed, leaving there traces of that conflagration. puose nome Filosofia. I assert and affirm that the lady of whom I was enamored after my first love was the most beautiful and honorable daughter of the Emperor of the universe, to whom Pythagoras gave the name of Philosophy. che si chiamò Pittagora. E che 750 years before the coming of our Saviour, about the time of Numa Pompilius, second king of the Romans, there lived a very noble philosopher by the name of Pythagoras. si riputava sapiente, negò a sè When Pythagoras was asked whether he considered himself a wise man, refused to accept the appellation for himself and said that he was not a wise man but a lover of wisdom. So it came to pass after this that everyone dedicated to wisdom was called a "lover of wisdom," that is, a "philosopher," for philos in Greek means the same as "love" in Latin, and so we say philos for lover and sophos for wisdom, from which we can perceive that these two words make up the name of "philosopher," meaning "lover of wisdom," which, we might note, is not a term of arrogance but of humility. persona amata; onde Pittagora dice: Love, according to the unanimous opinion of the sages who have spoken of it and as we see from constant experience, is what joins and unites the lover with the person loved. Consequently Pythagoras says, "Friendship unites the many into one." Since things that are joined by nature have their qualities in common with one another, to the extent that one is at times completely transformed into the nature of the other, it follows that the passions of the person loved enter into the person who loves, so that the love of the one is communicated to the other, as are hatred and desire and all other passions. * Dante, in paraphrasing Pythagoras' theory, means that all of these beings are equally noble with respect to their form; but with respect to their material or matter, they are noble in different degrees.